We first reviewed the Oncor microgrid back in April. This three minute video takes you inside the Oncor microgrid. Host David Chiesa, of S&C Electric, describes its state-of-the-art workings and how utilities like Oncor are using microgrids to keep the lights on during natural disasters. S&C and Schneider Electric built the microgrid at Oncor’s System Operating Services Facility (SOSF) near Lancaster, Texas. The innovative system consists of four interconnected microgrids and utilizes nine different distributed generation sources, including two solar photovoltaic arrays, a microturbine, two energy storage units and four generators. 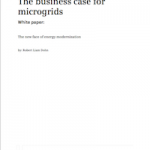 To turn these diverse generation assets into a microgrid, S&C and Schneider Electric developed a distribution automation scheme that leverages multiple intelligent grid solutions from both companies—enabling the four microgrids to effectively operate independently or as one larger microgrid. During a loss-of-power event, a combination of S&C’s advanced distribution automation equipment and Schneider Electric’s Microgrid Controller (MGC) use high-speed communications and distributed grid intelligence to automatically detect a problem on the grid. It starts with S&C’s IntelliRupter PulseCloser fault interrupter which detects an interruption in power, tests to see if the issue is temporary or permanent, and if it is permanent dynamically islands the facility. The system then uses S&C’s Scada-Mate CX Switches and Vista Underground Distribution Switchgear to automatically re-configure the distribution system while the MGC autonomously switches to alternative distributed power sources. “It does all of this in a matter of seconds, or faster than a customer could find their flashlight in the dark,” says Chiesa. Schneider Electric and S&C Electric Company will host an advanced microgrid video demonstration showcasing the recently completed Oncor microgrid in Washington, D.C. at Smart Cities Week, Sept. 15-17. The demo will show how the microgrid can improve energy efficiency and power reliability for Oncor customers while maximizing newly installed energy storage and renewable generation. Come see how cities can improve resiliency and control their own grid of the future with a direct, live feed from Oncor’s facility. To help educate and demonstrate the benefits of microgrids to residents, students, policymakers and businesses, S&C and Schneider Electric were asked to develop a microgrid demonstration facility on the SOSF campus. That facility will be known as Oncor’s Technology Demonstration and Education Center (TDEC) and consists of two exhibits – an immersion room and a demonstration center. In the immersion room, the Oncor microgrid story is brought to life on seven screens for a full cinematic experience. The microgrid story highlights the history of the electric grid and the changes Oncor has made over time. To arrange a tour of the Oncor microgrid contact S&C Electric via email: microgrid@sandc.com.